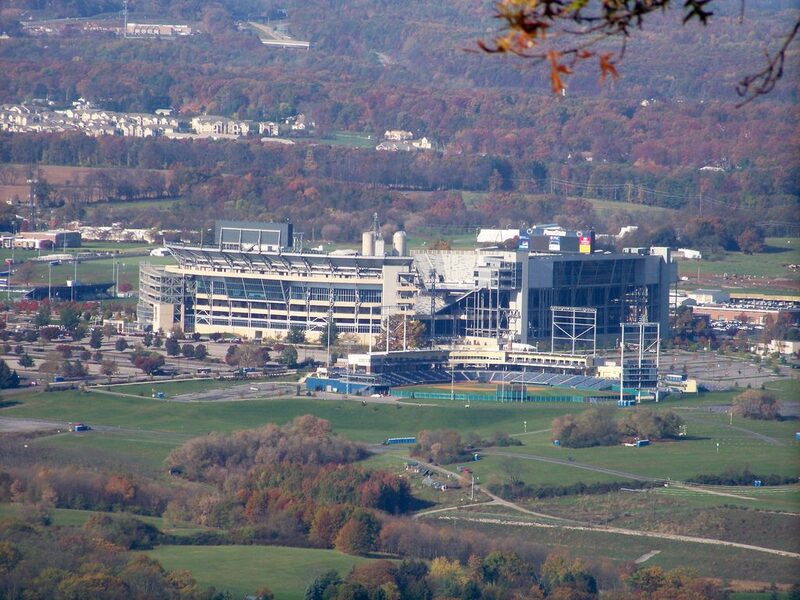 Welcome to Happy Valley, where each Saturday during the Fall this college football Mecca comes alive when the Penn State Nittany Lions are at home. Beaver Stadium has been the home of the Nittany Lions for over four decades and is one of the largest stadiums in college football. Throughout the past century the Nittany Lions have played at several facilities including a stadium also named Beaver Stadium. The original Beaver Stadium was located on the west side of campus and seated 30,000 fans. Named for James Beaver, President of the Board of Trustees, the Nittany Lions played at the original Beaver Stadium from 1909 until 1959. The university decided to disassemble the stadium and move it to its current location after the 1959 season. The team played its first game in the rebuilt stadium on September 17, 1960 against Boston University. Beaver Stadium’s horseshoe configuration enabled it to have a seating capacity of 46,284. The first of many expansions to Beaver Stadium was completed in 1969, when the capacity was increased by 2,000. Several additions came in the 1970s, including increasing the capacity to 57,000. In 1976, the bleachers in the south end zone were expanded. By 1978 the capacity was 76,000 after the track was removed from the stadium and the stadium was cut into sections and raised, adding new seats where the track was located. Two years later, the capacity was increased to 83,770 and lights were installed in 1984. An upper deck was added in 1991, increasing the capacity by 10,000. Continued fan support has allowed PSU to continue to improve and expand Beaver Stadium. Before the start of the 2001 season the stadium underwent a massive renovation. This project included the addition of a 10,000 seat upper deck, a new video/scoreboard, 60 luxury suites, 4,000 club seats and new restrooms and concessions. The latest upgrade to Beaver Stadium was completed before the 2014 season as both video/scoreboards were upgraded. Today, Beaver Stadium is currently the second largest stadium in college football with a capacity of 107,282, behind Michigan Stadium’s 108,000 seating capacity. Because of its size, Beaver Stadium has been named one of the scariest place for opposing teams to play.